Or freedom struggles to have birth. " Who was this woman with the unpronounceable surname, whose name and deeds blazed across the Irish skies in the momentous years of the early 20 th century? From what noble Gaelic stock was she sprung? Surely her family pedigree must rank among the finest of the old Gaelic aristocracy, be as eminent as the O’Neill or the O’Donnell, as proud as the O’Connor or the O’Dowd! Most rebels are made so by poverty and oppression. Constance Georgina Gore-Booth, for that was her maiden name, came not from such a background, but from a Protestant ‘planter’ family. This eldest daughter of Anglo-Irish landlord Sir Henry Gore-Booth, and his wife, Lady Georgina, was born on February 4 th 1868 at Buckingham Gate, close by the Royal Palace in London . The story of this beautiful, headstrong girl belongs to the pages of romantic fiction. Born to power and privilege she rode fast horses over her father’s thousands of acres. Presented at the court of Queen Victoria she was adopted as the darling of the Dublin Castle social set. Tiring of the social round she turned to conspiracy and war. Adopting the mantle of the revolutionary she was condemned to death; reprieved she became a national heroine. All her life Constance Markievicz was passionately devoted to women’s suffrage. Moving to Paris to study art she met and married Count Casimir Dunin-Markievicz. Following the completion of their studies they moved to Dublin where she met Padraig Pearse and Thomas Mc Donagh. It was they who fired her with enthusiasm for the goal of Irish independence. She joined James Connolly’s Citizen Army. Gaining a reputation as ‘The Rebel Countess’ she founded na Fianna Eireann, the national boy scout movement who were eventually to play a major part in the Irish rebellion. 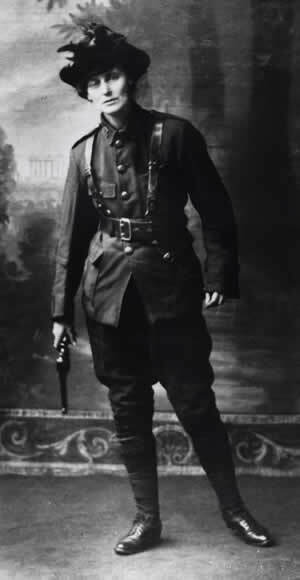 On the morning of Easter Monday 1916, clad in green uniform and carrying a Mauser automatic pistol, Countess Markievicz marched at the head of a small column of Citizen Army men to St. Stephens Green. During the battle that followed she served so bravely and fearlessly alongside her male comrades that her courage became a watchword and her name a legend. Following the surrender she was sentenced to death along with the other leaders of the rebellion. The British fearing a worldwide reaction if they executed a woman commuted her sentence to penal servitude for life. Released from Aylesbury jail in England following the general amnesty of 1917 she returned to Sligo to a rapturous welcome. During this visit she was awarded the Freedom of the City. Campaigning vigorously against the imposition of conscription on the Irish nation she fell foul of the British authorities once more and was imprisoned in Holloway Jail. During her incarceration she created history by becoming the first woman ever elected to the British Parliament. On March 10 1919 , she was released from Holloway and on the following June imprisoned once again in Cork Jail for making seditious speeches. On April 1 of that year following her appointment to the First Irish Dail as Secretary for Labour she achieved the distinction of becoming the first woman Cabinet Minister in the world. In September 1920 she was back in jail again, this time in Mountjoy, Dublin , when she was sentenced to two years hard labour for organising na Fianna. In July 1921, a Truce was agreed between the Irish and British forces and Constance was released. A split and Civil War ensued in which Constance opposed the Treaty and supported the Republicans. Arrested once more in November 1923 she was detained in North Dublin Union, went on hunger strike, and was released in December 1923. Having dispensed her possessions to the poor of Dublin she died penniless in an open ward in a public hospital on July 15 th 1927 . She was 59 years old. Although her contribution to the cherished dream of a free Ireland was immeasurable, a hostile Freestate Government refused her the recognition of a State funeral. Ireland on that day mourned one of our greatest heroines. Today, enjoying the fruits of her struggle, we remember and rejoice in the achievements of the 'Rebel Countess' and her comrades. Their greatness and their deeds inspire us! To be free in a prison cell? Thou shalt be young. " Footnote: The similarity in recognition of Constance Markievicz's social surroundings to Sr. Mary Aikenhead, founder of the Sisters of Charity and born eighty years before, is remarkable. Born an Anglican Protestant into a privileged Ascendancy family at Grand Parade, Cork, Mary converted to Catholicism shortly after her father died. He too had converted to the Catholic faith just before he passed away. Just as Markievicz had recognised the poverty with which she was surrounded, at an early age Mary Aikenhead too 'noted the great difference between the pampered life of the wealthy and the pathetic lives of the poor.' In September 1816 she took her perpetual vows, including one to devote her life to helping the poor. At her death in July 1858 it was said that 'Ireland's poor have lost their best friend'.